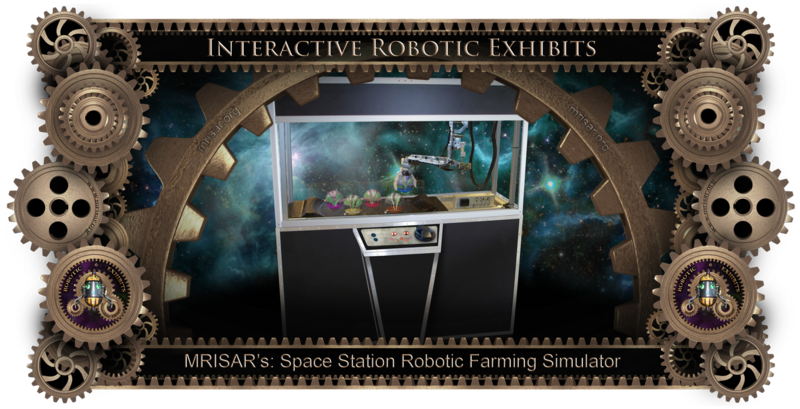 This Robotic Arm Exhibit simulates farming in a space station environment by tending plant spheres. 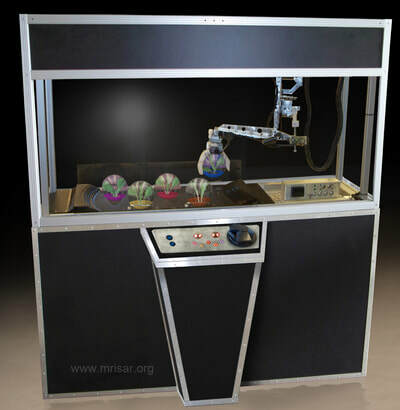 It can also see colors. 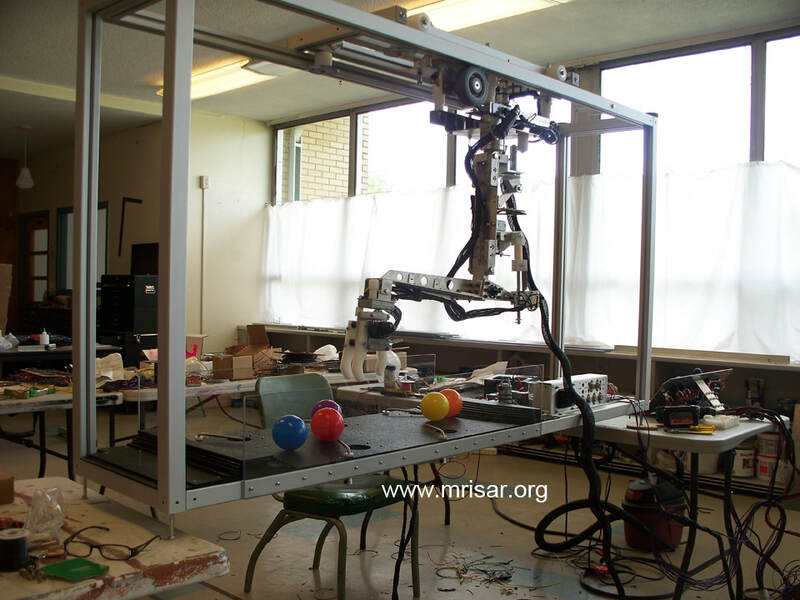 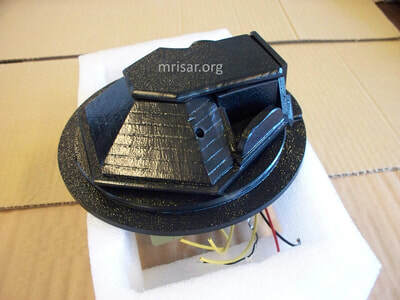 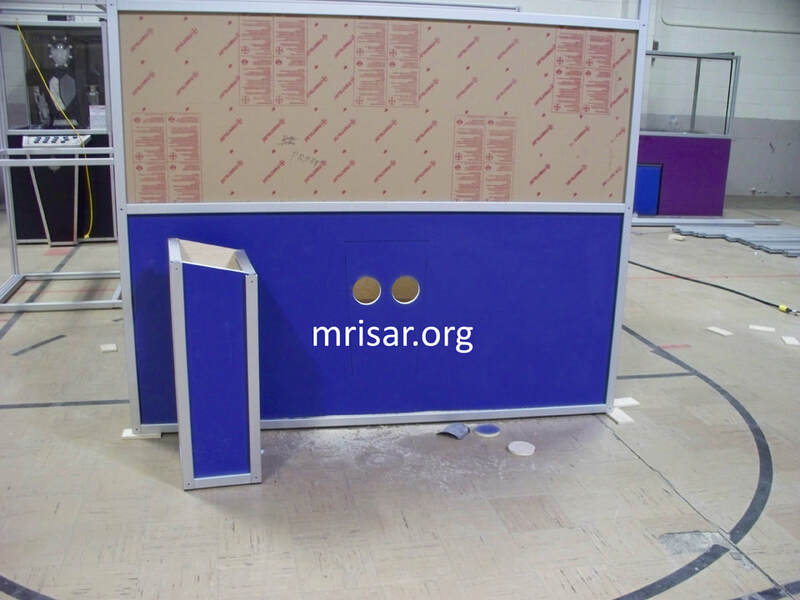 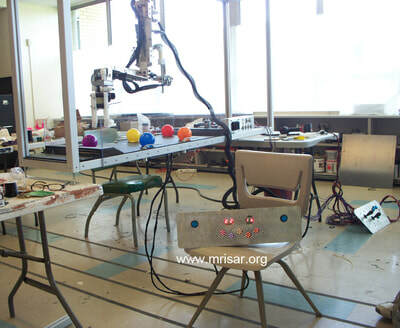 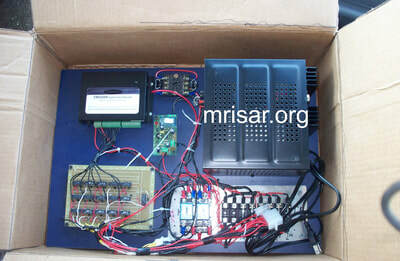 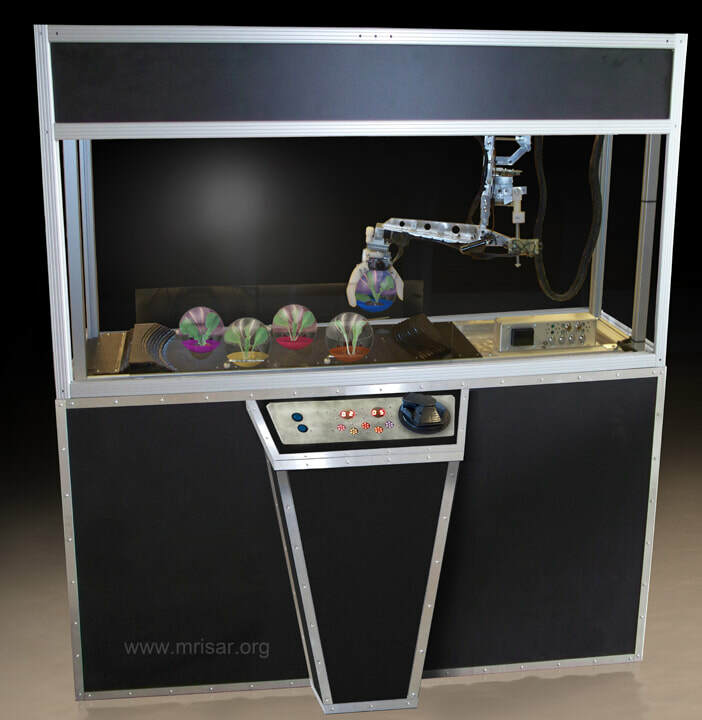 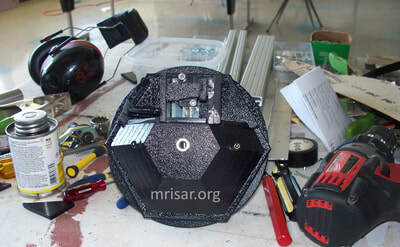 The challenge: the User’s mission is to place all the spheres containing growing plants into the depressions by operating the Robotic Arm within a timed duration. 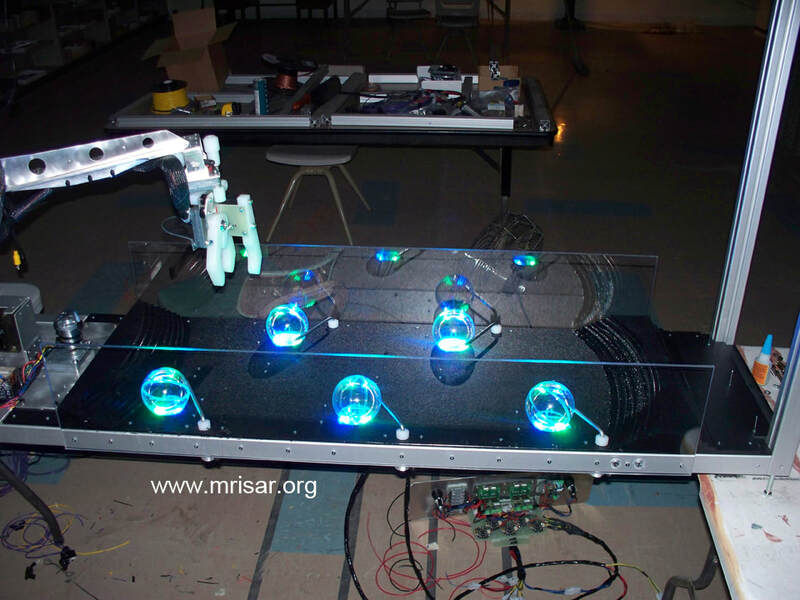 As each color-coded sphere is replaced, a light of the same color illuminates on the control panel via the interpretation of a set of six microprocessors. 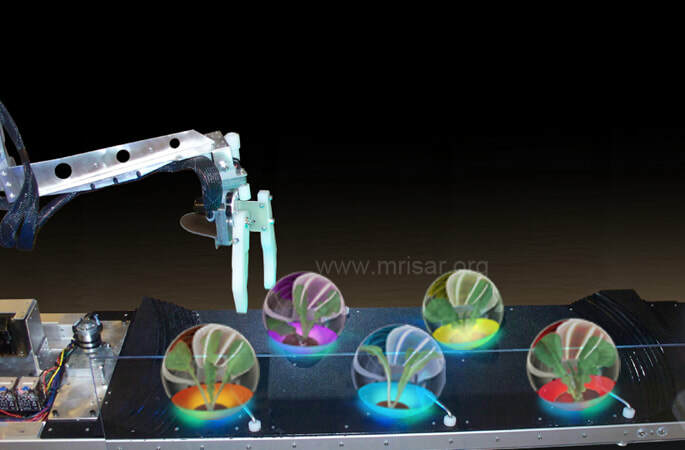 When you complete your mission by replacing all the plant spheres, the depressions illuminate with a brilliant blue light and the task resets itself and dislodges the spheres for the next User. 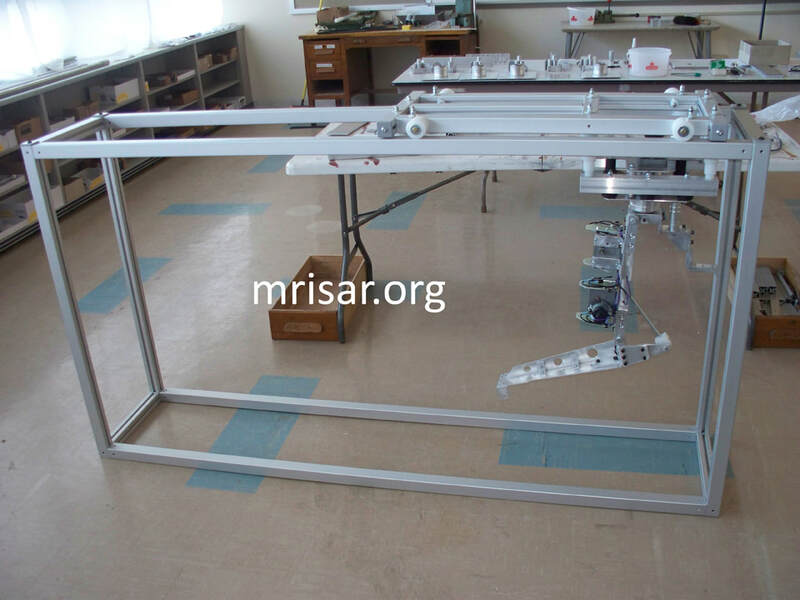 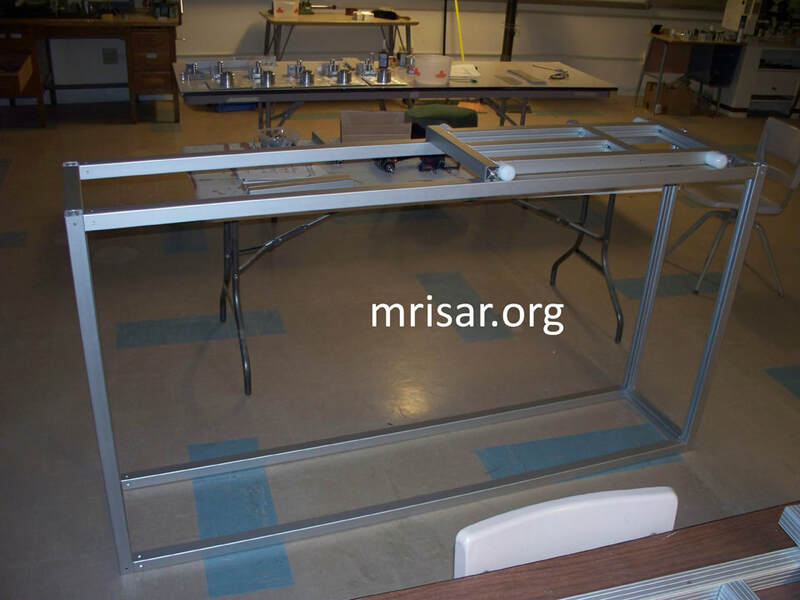 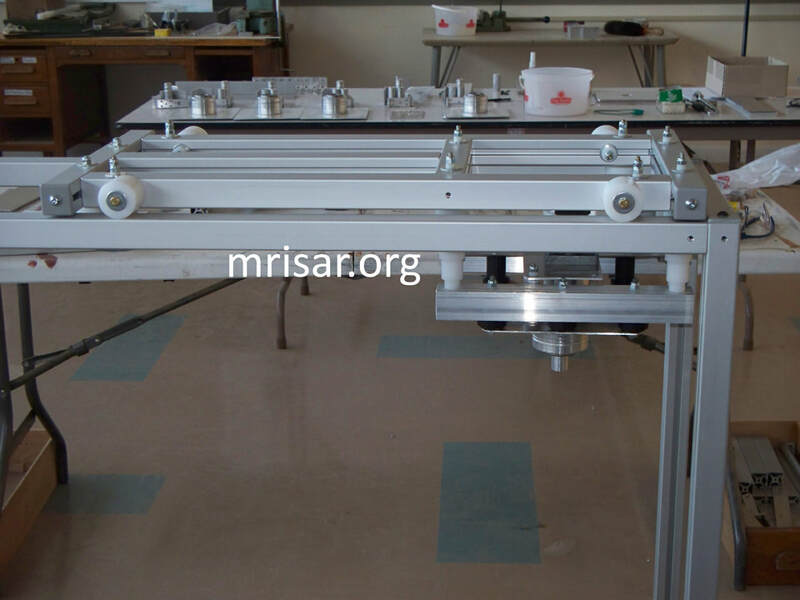 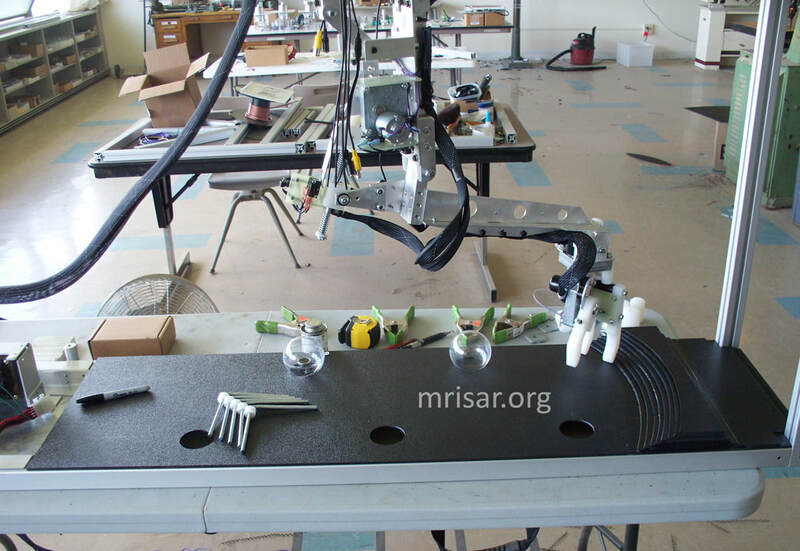 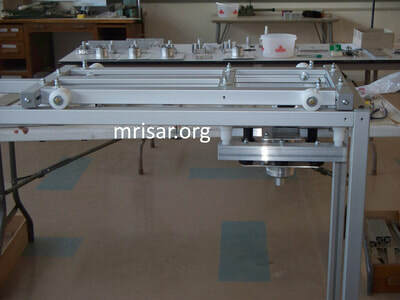 This exhibit features a 39" long, five range of motion, 3 finger electromechanical robot arm that is mounted on a rail system that allows the arm to glide from one end of the exhibit to the other. 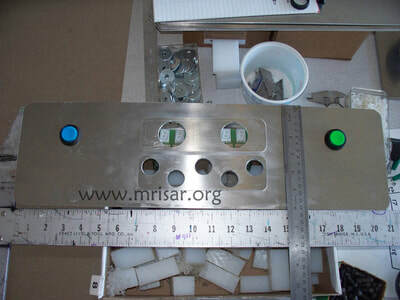 The fingers come in either black or white UHMW. 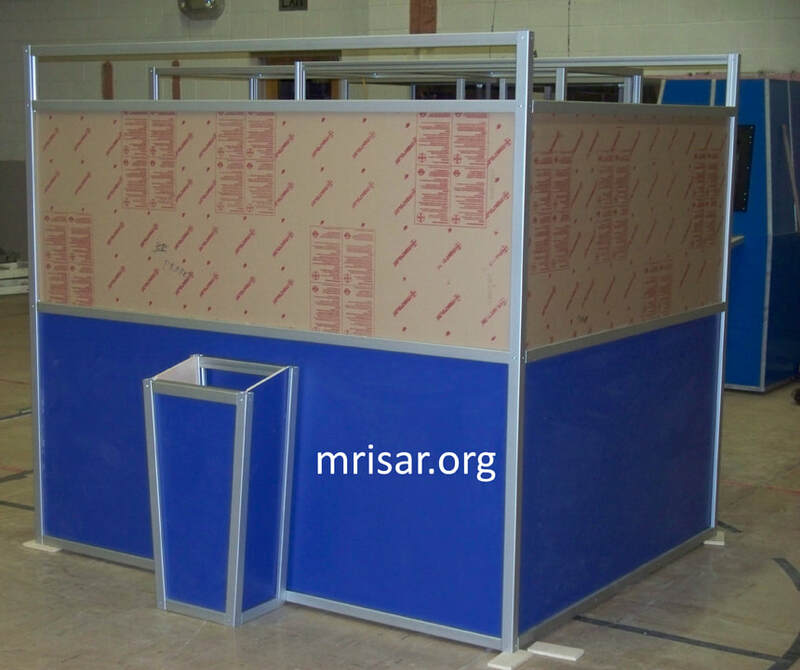 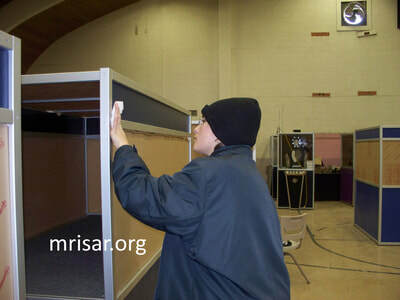 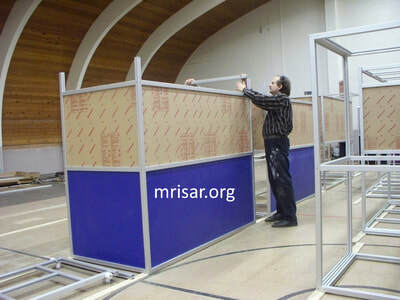 The exhibit activity is totally encased by clear poly-carbonate that allows many people to view the exhibit while it is being operated. 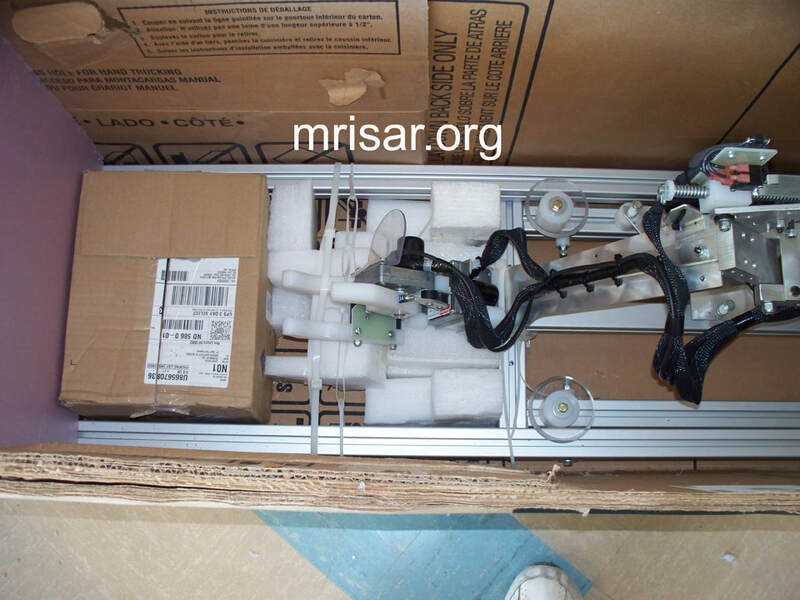 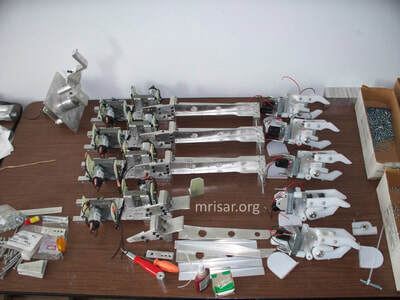 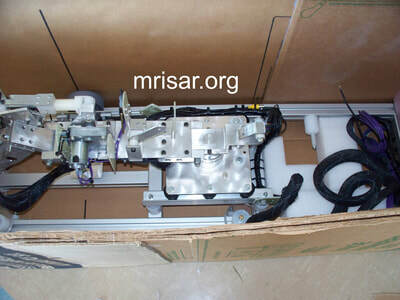 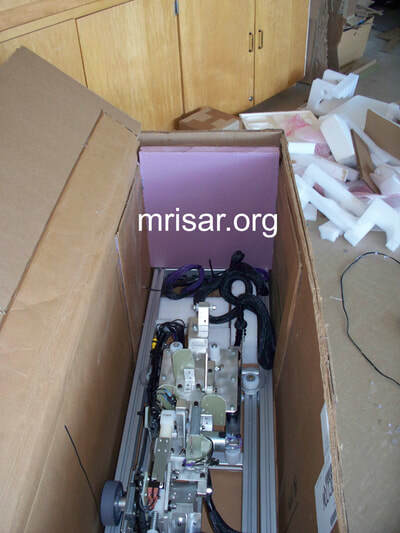 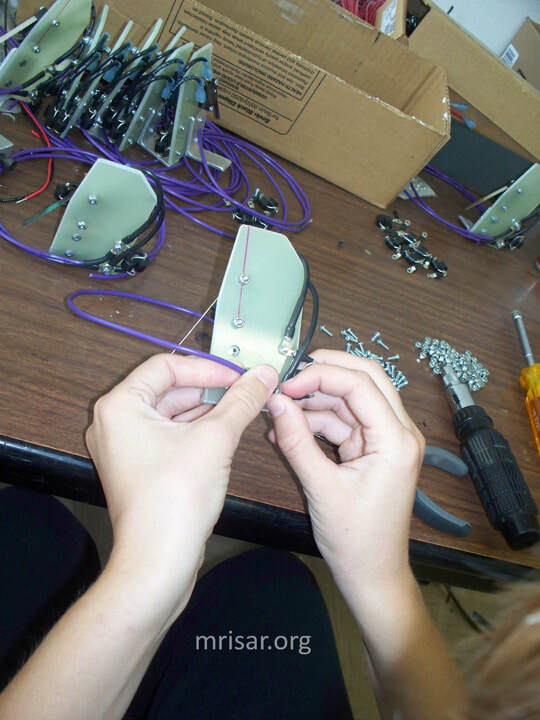 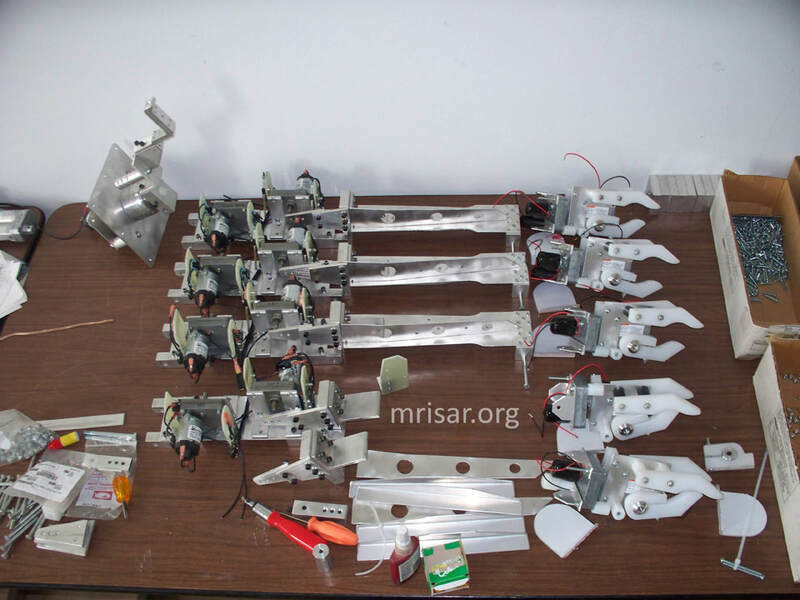 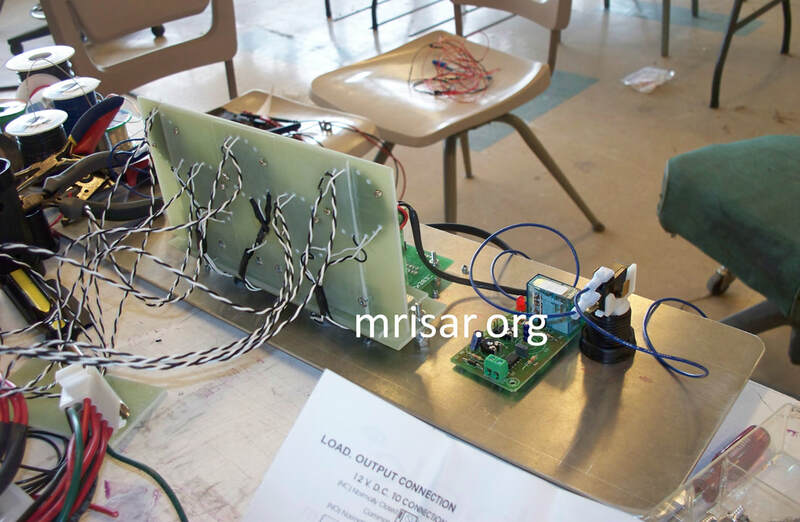 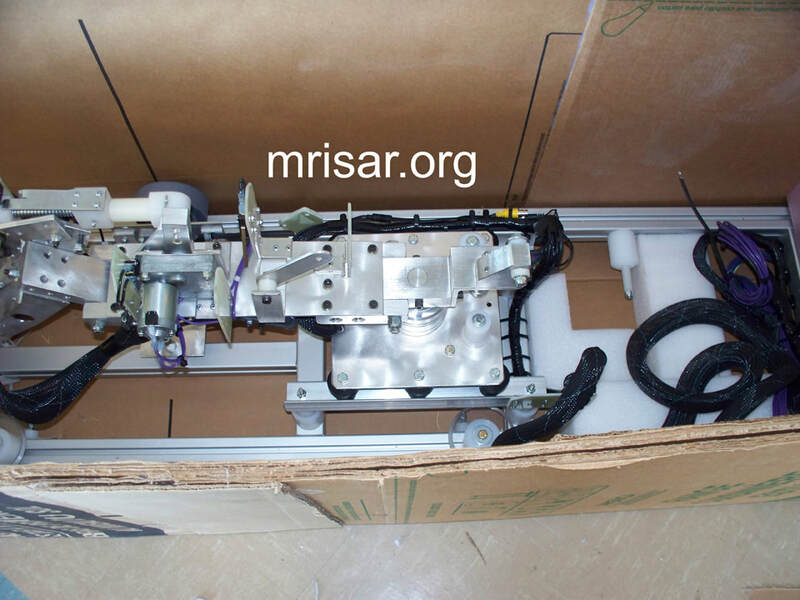 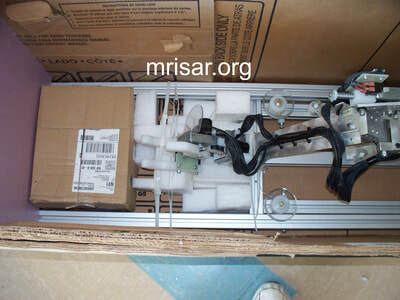 The electromechanical arm is designed in a totally open format, all the parts and the key components that operate it are visible for maximum educational merit. This relates to STEM education. 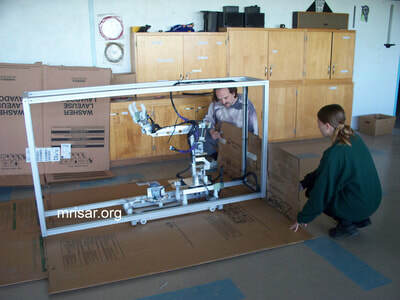 The exhibit challenges a visitor’s skill and dexterity while providing a unique format to study the engineering principles of a robot arm. The exhibit's approximate measurements are 8’ long x 72" high x 35” wide (less the control console which adds about 12” to the depth). 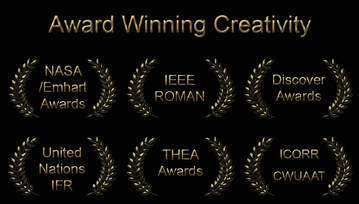 The arm has pressure sensitive and end of travel limits, and can adapt to objects stacked in its path. Remote handling robots are used by industry, aerospace and commercial establishments to extend human capabilities in hazardous situations. 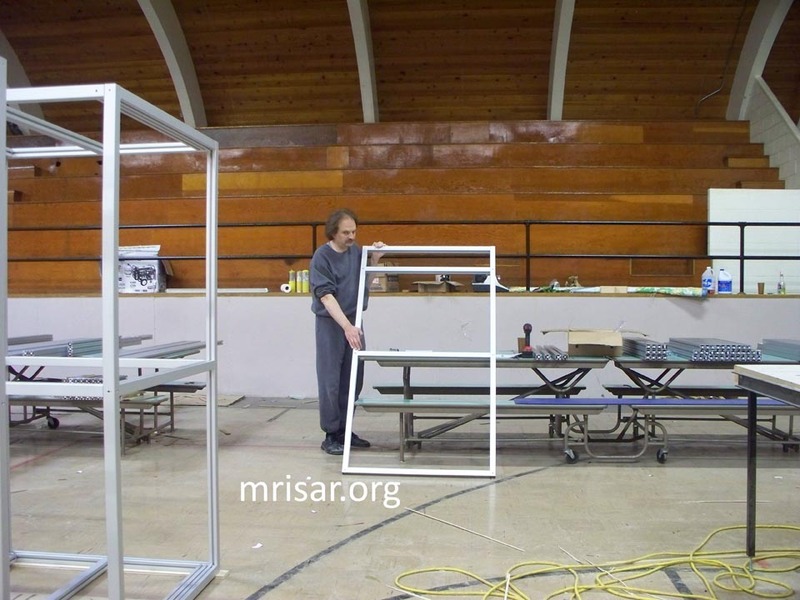 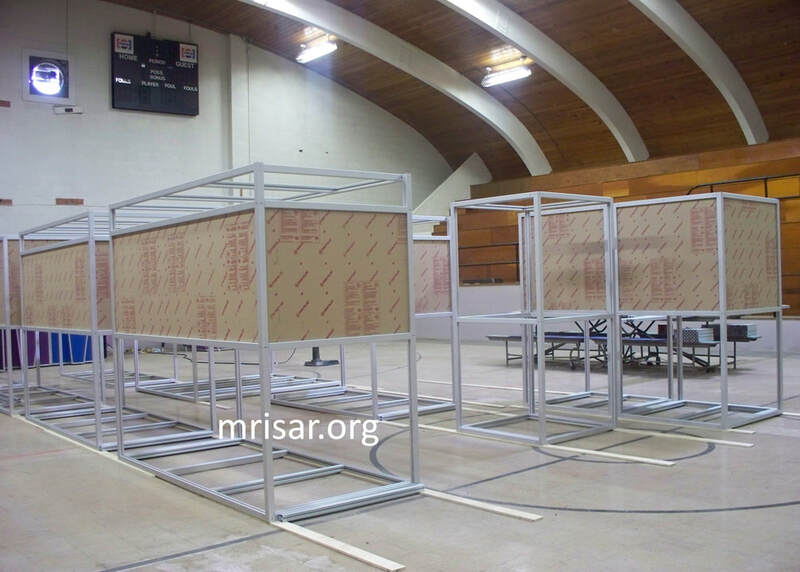 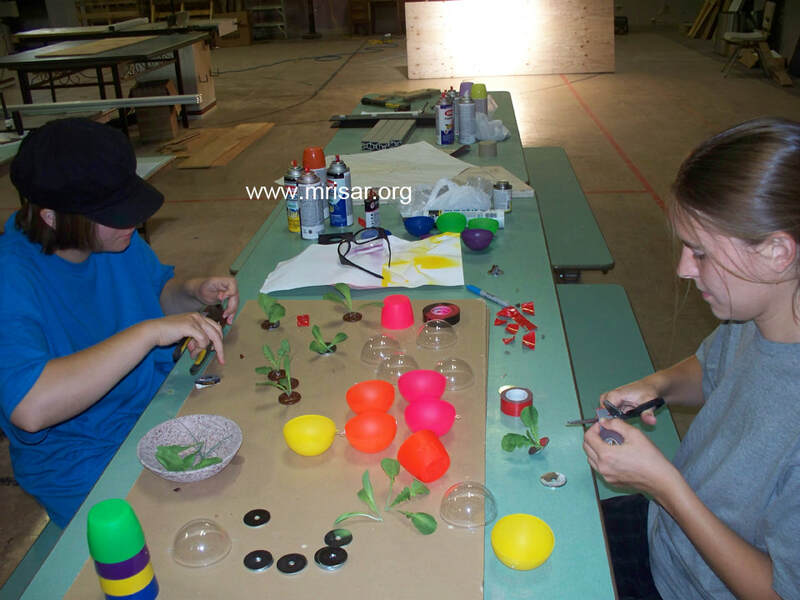 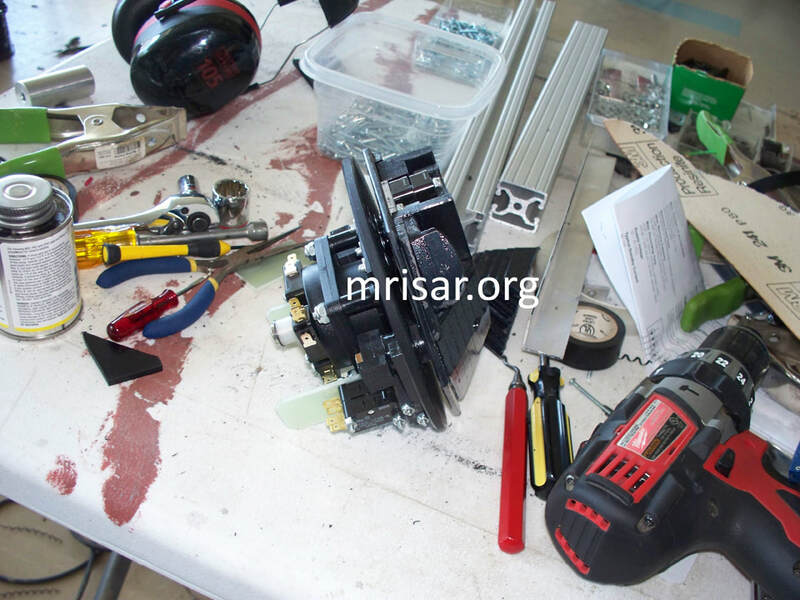 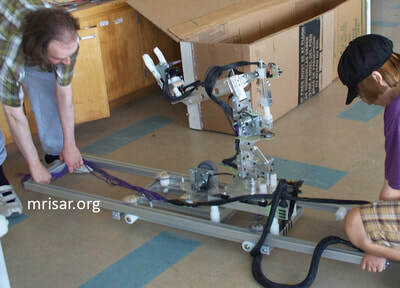 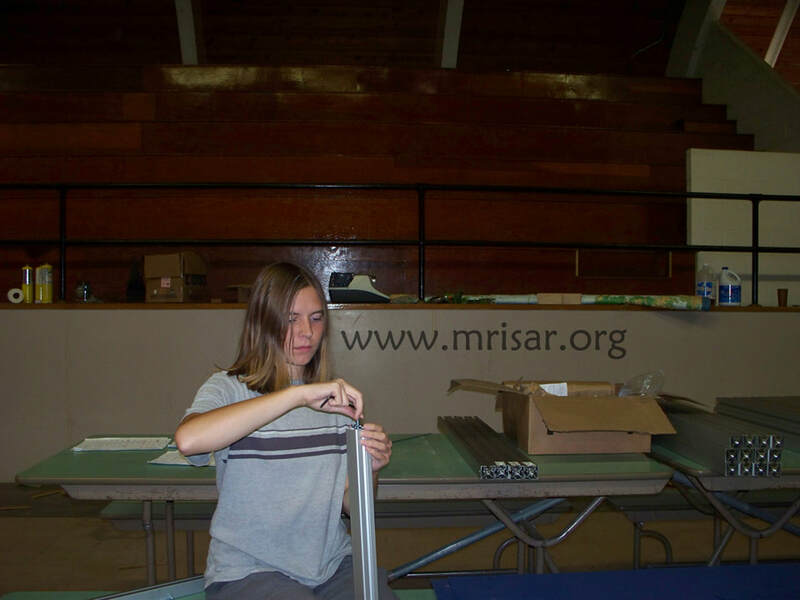 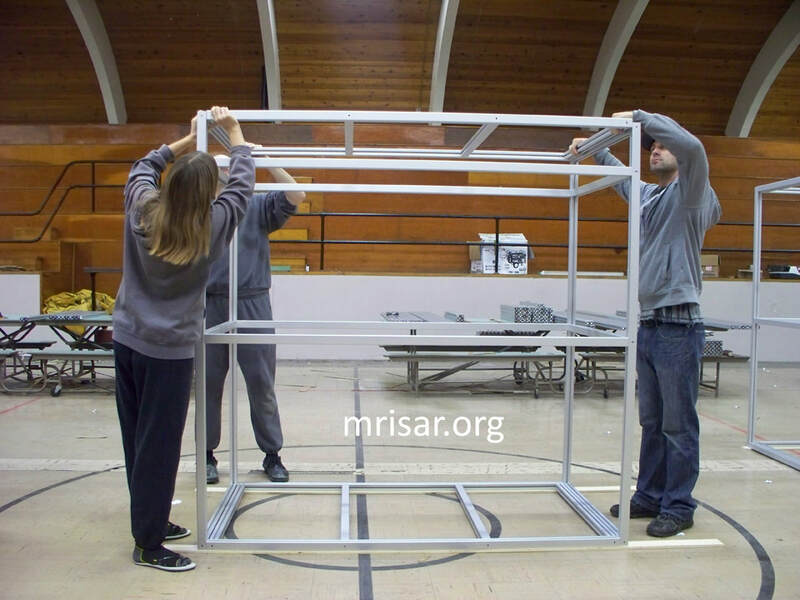 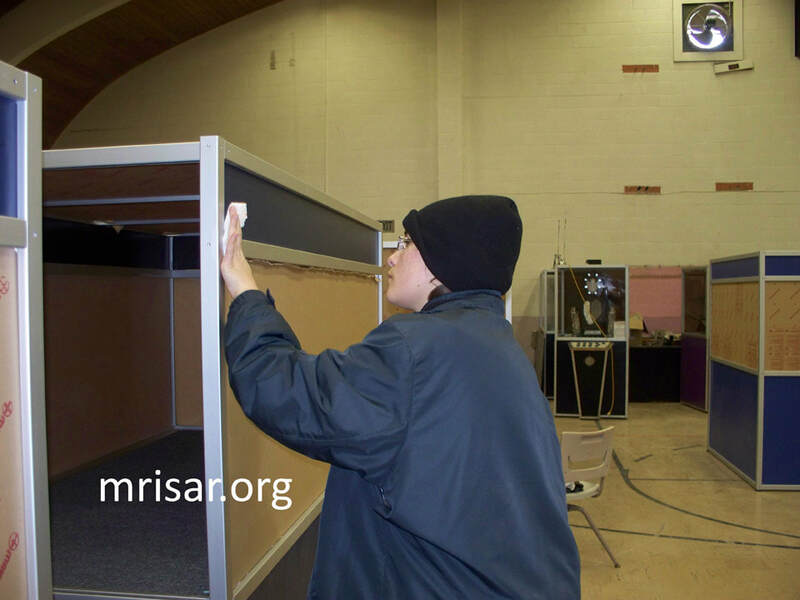 Below MRISAR's R&D Team members Autumn, Aurora and John Siegel designing and fabricating the first prototype of the Space Station Robotic Farming Simulator Exhibit in 2015.